The costume I have been working on (with friends!) 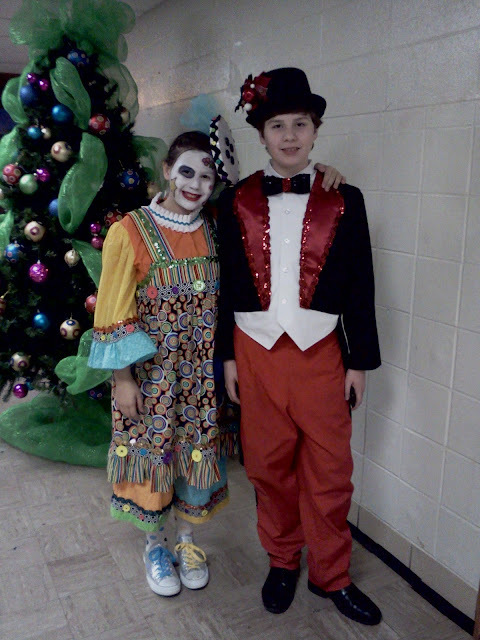 is finished and the Clowns and Stars went on tour this past Wednesday. I still need to get a photo with stage lights on the dress. The light in the hallway at school doesn't show the sparkle that is on the dress. In addition to the costume for DD, I also worked on the accessories for the Stars. That means top hats and bow ties for the boys and berets, muffs and earrings for the girls. There are 24 boys and 24 girls! I am thankful for the other parents that stepped in to help with this project! 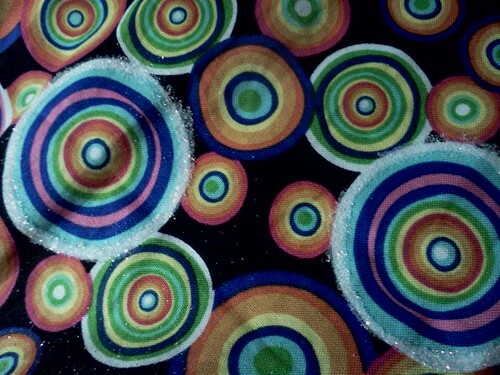 Here's my best advise for adding sequins - sew them by machine using a wide zig zag stitch and a jean needle! Take your time and pay attention. You may be able to ease the machine through the rough spots and save your needle. It still took me three needles to sew on all of these sequins but a regular needle would have been much worse! Fall has fully arrived in the Tennessee Valley now! We have had several frosts (at least in my neighborhood) and nights have been quite chilly with comfortable days. This is truly a spectacular time of year with the temps and the display of color that abounds in nature right now. But that is not the only change going on in town. Rumors have been flying with regards to the combination of Lee High School and New Century into the new high school that is being built. Until yesterday, the new school carried the name Lee High School above its entrance but now that has been removed. What name will go there is now up in the air, much to the annoyance of alumni and friends of Lee. A parent meeting was held Tuesday night at New Century with our superintendent in attendance. This is where the news was announced that New Century would be moving into the new building and that the two schools would become one with a new name. It didn't take long for the trouble to be stirred up on FB! I think this merger could be a very good thing for both schools but Dr. Wardynski could have handled this news in a much better fashion. The Lee faculty,parents and students should have received this news from Dr. Wardynski at the same time the New Century school did. Beginning with a joint meeting and then individual meetings to address concerns would have made this much easier on the two communities. Now Lee students and parent plan to swarm the board meeting tonight to air their complaints. Sit-ins have been planned. Petitions are floating around. This does not bode well for the new school. At this point, it seems a division has been created over who will have charge rather than a united community that can do so much more. Surely building a consensus from the beginning rather than dividing would have been better. I hope Dr. Wardynski rectifies this mistake quickly. From earlier posts you may know that I live in the Lee district but chose not to send my oldest child there because I was not confident that she would get what she needed to continue her education. We chose to send her to Columbia and the IB program there. It is a long drive from my home but, she is thriving in the IB program and I cannot imagine a better choice for her. My next child will be entering high school in 2012 and what school he attends is still to be decided. New Century was an option I was willing to consider for him but that might not be an option now. I am going to be watching to see how this merger takes shape. I certainly would not want to send him in to an environment that seems quite hostile at this point. We were blessed this weekend to have Dr. Darrell Guder at our church for the Kyser Lecture Series. I got to hear him all 3 times though the first two were essentially the same service. Dr Guder is a professor at Princeton Theological Seminary and an authority on mission and ecumnical theology. The afternoon lecture has truly left me thinking. Dr. Guder spoke about life in a post Christendom world. This world can be very dangerous and full of stress. He argued that the time of Christendom really began to disintegrate with the beginning of the first World War when Christian kings attacked each other in what would be a the worst war the world had seen. We now see the rise of a new religion called Secularism. This has brought about the absence of prayer in school and pushing out of God from our public lives. Then Dr.Guder became more specific in talking about the Presbyterian church and particularly the church in the US. He used scripture to point out the way early Christians made decisions. They would gather, pray, discuss, pray and await a concensus created by the Holy Spirit. He argued that our downfall might well be in our system of voting our way to decisions. I think there is much to be considered in this argument. I think waiting on the Holy Spirit and God's timing might be one of the most difficult jobs a Christian has. Yesterday you saw the costume without embellishment and now I can show you the first step of the embellishment process. 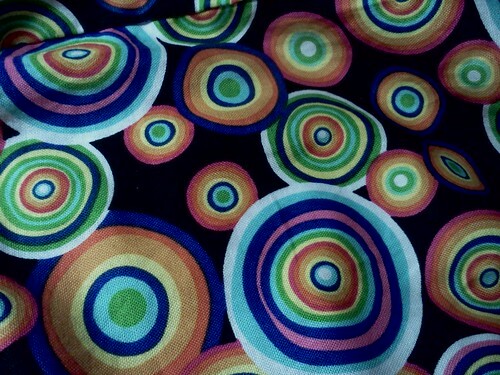 This is the fabric of the pinafore before I begin the glittering. And this is the start of the glittering. I paint a fine line of glue made to be permanent after drying onto each individual large circle and sprinkle with glitter. Time consuming but the results are so going to be worth it! I have been MIA for a while now due to some things going on in life. I have written a blog update that has not been finalized yet too. I'm just not comfortable with it yet. But this is something I can share with you. My baby is a clown this year at AAA and today was the initial costume parade. That means that all the children in her class were to bring and wear their costumes for inspection today. Being finished head to toe is where we are supposed to be and I am so happy to say that she was done head to toe! We finished it last night late but it looks so cute! And the best part is that she loves it! 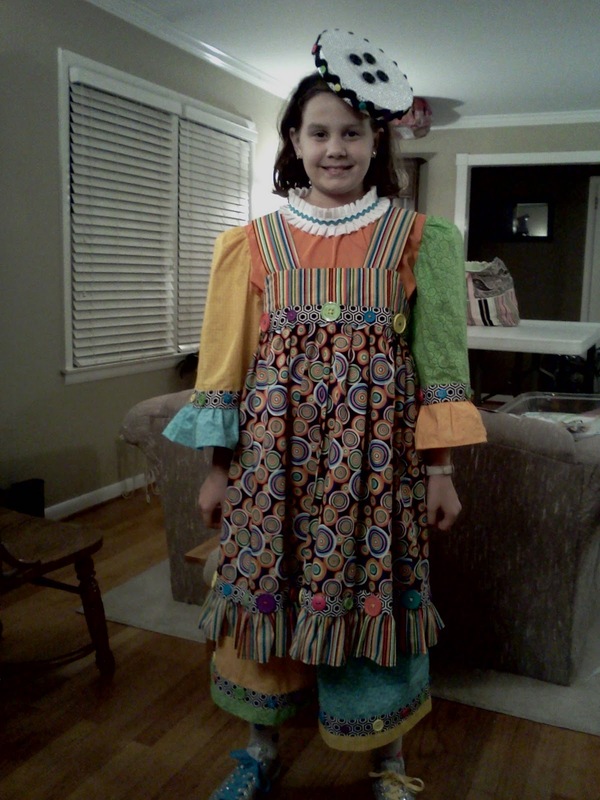 She wanted to be a button clown and I think we have made that work for her! Once it is all sparkled up, I will share another picture. We got glitter to paint on and lots of sequins to add! Remember the blog post I couldn't write? Well the new carnival is up and looks great! Thanks go to Heather of Heather's Hints. She did a great job this month! You can find the carnival here. The RCB group is full of talented writers and you are sure to find something in there you didn't know before. I know it has been a while since I posted one of my daily gratitudes but I will try to get back in the rthym of posting these. Today I am thankful for many things! I am thankful for my Disciple Bible study class. It has been several years since I participated but I am loving this class on doctrine! I am also thankful for ArsNova and the teachers there who do such wonderful work with talented young people. My oldest DD is so blessed to be able to study there! I am also thankful for my carpool friends! Most afternoons I take 2 children from AAA to Columbia HS where their mom works. Today, I only had the youngest child as his sister and my two were staying after for auditions. He got in the car and proceeded to tell me all about his new recorder and then asked if he could practice it in the car on the way to Columbia HS. I agreed that he could after he buckled his seat belt. I would never have let my own children do this! I was serenaded all the way by him as he practiced Hot Cross Buns. It was so cute! It makes me sad that I never had the patience to enjoy my own kids this way but I am going to try to work on that! So God has been so good today! I am blessed (though convicted) and inspired to be a better mom. Day 11 - I am Thankful!